TOKYO -– Suzuki Motor Corp. Chairman Osamu Suzuki today said he plans to end the carmaker's turbulent two-year capital alliance with Germany's Volkswagen AG, citing concerns about independence and a dearth of technological exchanges and joint projects from the tie up. The spry, 81-year-old Suzuki executive compared the breakup to a divorce and said the two companies should "say goodbye with a smile" instead of trading bitter accusations. 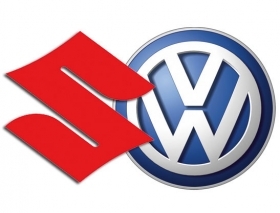 But much of a sometimes heated press conference early today in Tokyo was spent jabbing VW, which bought a 19.89 percent stake in Suzuki in December 2009. Osamu Suzuki compared their partner to a "ball and chain" and suggested the Germans weren't acting like grown ups. Executive Vice President Yasuhito Harayama, who led negotiations with VW, compared the German automaker's accusations that Suzuki had violated their contract to a declaration of war. It was impossible to maintain healthy relations under such conditions, he said. But later Monday in Europe, VW Chief Executive Officer Martin Winterkorn said Volkswagen has talks planned with Suzuki to try and find a resolution for their strained partnership. "We'll have talks, then see where we are," Winterkorn told reporters at an event on the eve of the Frankfurt auto show. Other VW officials also put on a brave face after Suzuki asked for a divorce on Monday. Volkswagen chairman Ferdinand Piech, who played an active role in initiating contact between Suzuki and Europe's largest automaker, said it was now up to VW's managers to see whether the alliance could be revived. "We are pleased with our investment," said Volkswagen Chief Financial Officer Hans-Dieter Poetsch, adding that as far as VW is concerned the ball is now in Suzuki's court. "Suzuki has not stuck to the agrement. We have pointed this out to them and now it is up to Suzuki to react. The contract did not say that you communicate via the press that you don't want to continue the partnership." The continued acrimony came even as the Suzuki chairman demanded that VW sell its stake in Suzuki. In return, he said, Suzuki would offload its 1.49 percent holding in VW. "I thought they understood that being a partnership of equals was important, but it gradually changed," Suzuki said, adding that his company wanted to protect its independence. "If it keeps going in this direction, it will become a ball and chain for Suzuki's management." With the war of words between the companies heating up over the summer, VW said Sunday that Suzuki's decision to buy diesel engines from Fiat S.p.A. infringed on their partnership. Harayama disputed this saying that the Fiat sourcing had been in place for a long time and that posed no conflict because VW could not supply a similar engine. "It was absolutely not a breach of contract," said a visibly agitated Harayama. Suzuki then tried to lighten the mood by joking Harayama was so "excited" because he was the chief negotiator. Both executives claimed the decision to break with Volkswagen stems not from the Fiat accusation but from comments VW made to investors, starting with an April message in its annual report. It said the German partner could "significantly influence financial and operating policy decisions" at Suzuki. It also described the Japanese company as an "associate." Fiercely independent Suzuki -- who also hold concurrent titles as CEO and COO of his namesake company -- took umbrage with being rolled in with VW's collection of global brands. "I was very surprised," he recalled. But he said the tipping point came July 29, when VW reportedly told shareholders it was putting the partnership under review. Suzuki said in an interview on Aug. 10 that the company "sees no reason why Volkswagen would be upset" about Suzuki expanding its purchase of engines from Fiat. When the VW-Suzuki deal was signed in December 2009, the companies said they intended to cooperate on technology, including hybrids and electric cars, and expansion in emerging markets. Almost two years later, no joint projects have begun. "There were no projects that progressed," Suzuki complained at the news conference. VW, which forecasts deliveries will rise 5 percent this year after selling 7.2 million vehicles in 2010, aims to surpass Toyota Motor Corp. and General Motors Co. as the world's largest carmaker by 2018 and is targeting India as an expanding market to boost sales. Suzuki, which sold 2.64 million cars in its last fiscal year, delivered 1.13 million of those vehicles in India. VW sold 53,300 cars in the country in 2010. Osamu Suzuki wrote in a July newspaper column in the Nikkei newspaper that he hasn't found any VW technologies he'd like to adopt following an extensive review of what they have to offer. And today he said the key condition for any future partner would be having "an adult mentality." Asked if VW didn't have that, he corrected himself: "A good adult relationship." Winterkorn said in May the automaker planned to target the small-car segment in India as a potential joint project with Suzuki, as well as parts procurement and development of alternative-drive technologies. While Suzuki has a dominant position in India, where its Maruti Suzuki India Ltd. unit is the market leader, increased competition makes holding the top spot harder. VW's global reach and product portfolio, with more than 60 models at the namesake brand alone, could help.